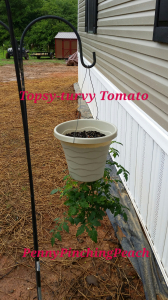 I know most of you are familiar with the fad of topsy turvy tomatoes. The bags they made for the purpose just didn’t appeal to us that much for using over & over, so we decided to make our own. There may be other affiliate links, which help my family while sharing deals with you! Categories: Frugal Family | Permalink.